Relevance The ATM protein is a member of the phosphatidylinositol-3 kinase family of proteins that respond to DNA damage by phosphorylating key substrates involved in DNA repair and/or cell cycle control. It is thought that the activation of ATM by autophosphorylation might be the initiating event of cellular responses to irradiation. 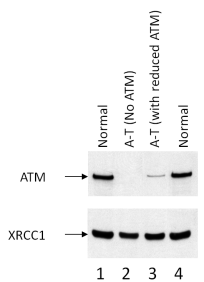 The classic form of ataxia telangiectasia, an autosomal recessive cerebellar ataxia, results from the presence of two truncating ATM mutations, leading to a total loss of the ATM protein. Dynamics of DNA damage induced pathways to cancer. Tian et al. 2013. PLoS One. 8(9):e72303. PMID: 24023735. Reiman et al. 2011. Br J Cancer. 105(4):586-91. PMID: 21792198. 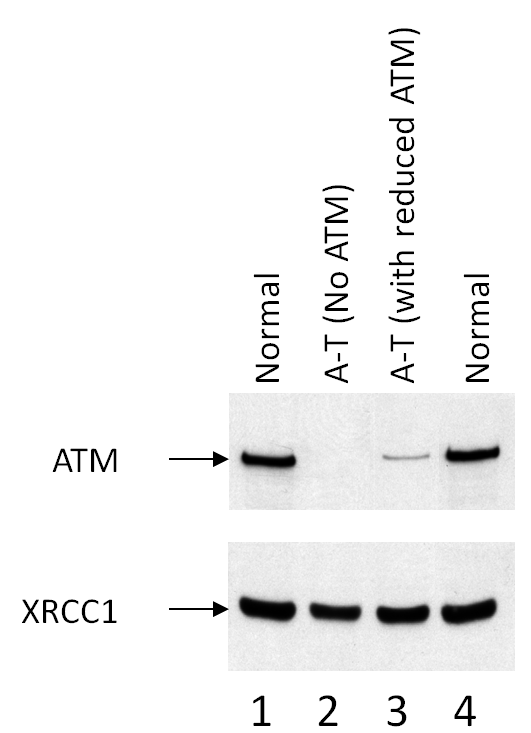 Lymphoid tumours and breast cancer in ataxia telangiectasia; substantial protective effect of residual ATM kinase activity against childhood tumours. Dutton et al. 2007. Blood. 109(6):2597-603. PMID: 17148591. Bmi-1 is induced by the Epstein-Barr virus oncogene LMP1 and regulates the expression of viral target genes in Hodgkin lymphoma cells. Clements et al. 2004. DNA Repair (Amst). 3(11):1493-502. PMID: 15380105. Starczynski et al. 2003. Am J Pathol. 163(2):423-32. PMID: 12875964. Variations in ATM protein expression during normal lymphoid differentiation and among B-cell-derived neoplasias.